Sola Osofisan interviews Kabu Okai-Davies, Australia-based Ghanaian poet, playwright, novelist, short-story writer and theatre producer. The widely travelled author of Curfew’s Children, a recently published childhood memoir, has been published in Transition magazine and other print and online journals. Okai-Davies has earned multiple degrees, including a Master of Studies from the Australian National University and a Master of Creative Writing and a Ph.D. in Communications from the University of Canberra. 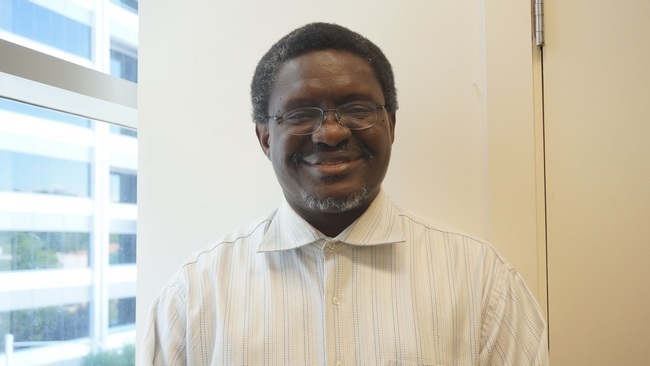 He has taught extensively in the areas of Theatre, African Cinema Studies, Creative writing and African philosophy and Literature. Author of Long Road to Africa and In Another Man’s Name, Okai-Davies is currently a Visiting Fellow in Writing at the School of Arts and Humanities at the Australian National University. AW NOTE: Dr. Okai-Davies passed away on February 17, 2017, after a battle with cancer. He was a good friend of Africanwriter.com. Sola Osofisan: “Ayalolo” is a real place. You were born there. The first time I read of it in your short story, The History of a Drink, and you called it an “imaginary country”, it sounded so believably fictional. It even rhymes with the stage name of a popular Nigerian comedian – Papalolo. When last were you there? Is it still a real place for you even as you live so far away? Kabu Okai-Davies: Indeed, Ayalolo is a real place. It is one of the suburbs in Central Accra. However, it holds deep mythological significance in my imagination. Simply because, the literary translation and meaning of the word “Ayalolo” is we are still going. In this case it connotes the idea of an odyssey in my literary vision. I am using it the same way Gabriel Garcia Marques uses the mythical town of Macondo in his novels. Many writers have created fictional countries and cities, and in this case, I have sought to mythologize Ayalolo, as a metaphor for Ghana. During the struggle for Ghana’s Independence, Kwame Nkrumah held his rallies at Ayalolo at the Arena. It was from the Arena that he honed his oratorical skills as a populist; hence, Ayalolo features greatly in the collective imagination, as well as in my imagination as a writer. I am still evolving the mythology of Ayalolo, and sooner than later, I intend to publish a collection of stories, called: The History of Ayalolo Country and Other Imaginary Stories. In my book, Curfew’s Children, I give an oral history of Ayalolo as it was told to me by my mother and how I knew about, lived and experienced the evolution of Ayalolo as a child. My uncle the poet, Atukwei Okai, also mythologizes Ayalolo in his poetry and is famous for the title of one of his works: Ayalolo Concerto. Sola Osofisan: Atukwei Okai is your uncle? Now it clicks why the “Okai” in your name keeps ringing a literary bell. I have read quite a bit of his poetry. I recall we studied his poetry at the secondary school level back in Nigeria. Did he influence you in any way, maybe your poetry which I love? Kabu Okai-Davies: Oh, Atukwei, my favourite Uncle. He has been a towering figure in my life, not just as a writer but as a person since childhood. He’s influenced me in many ways. I was his General Secretary when I was at the University of Ghana, at the Ghana Association of Writers, while he was President. And certainly, I borrow from him, his poetic narrative style and his oral presentation of poetry. He is a great performance poet of the African oral tradition and he truly inspires me. We used to do public readings together in the early ’80s and when I did return to Ghana recently — 2011-2012 — we did spend some really useful and quality time together. Ideologically, he is my guidepost and anchor in the Nkrumaist tradition. He is my uncle on the Okai side of my mother’s family. Hopefully one day you will get a copy of Curfew’s Children and you will understand how I ended up becoming an Okai-Davies. My mother is the Okai and my father is the Davies. Sola Osofisan: Did you discover books early in life? How did growing up in Ghana prepare you to become the writer you are today? Kabu Okai-Davies: Books have always been a part of my life. I was fortunate to have had a mother who was a teacher and head teacher of schools in Accra and Kumasi. She read many of the Longman abridged classics to me and my brother as we were growing up. I write extensively about my mother whose influence on me has been the most profound. However, the irony it is that, I resisted reading growing up; instead I preferred to draw. I was always drawing and preferred to draw out the pictures from the picture books and ignore the words. In any case, around the age of 17 – 18 years of age, a combination of factors came together and caused me to start reading. I was able to translate the drawing bug into a writing ambition, and writing forced me to start reading. Once I started reading and intensive writing, I couldn’t stop. Between the ages of 17 to about 27years of age, I read voraciously, especially poetry, novels, history and biographies and kept voluminous journals and diaries. In fact I spent the nights of the 1978 – 1984 curfews, reading and writing, dreaming of pursuing my career as a writer, overseas. Sola Osofisan: It sounds like you’re the first writer I know who started writing before the reading bug bit him. In your poem, Exiling Exiles, “Exile is a resting place for those who / Left behind the shadows of ancient strife…” Do you consider yourself in exile? Kabu Okai-Davies: There is a certain double consciousness about the idea of exile and home for me. In the personal sense, I wish that I could be living the life I have now, not in England, America or in Australia, but rather in Africa. That Africa was a place where I could live and experience that sense of literary expressiveness, material, social and economic security. But we all know that is not the case. I miss home – Ghana – a lot and there is a sense of ambivalence for me, being or living around the world, and yet longing for home. The shadows of strife that I write about are the strife of tribalism, religious obsessions and the enigma of African poverty, illiteracy and corruption, military coups, civil wars, epidemics, etc. In our quest for enlightenment, material comforts, social reforms, cultural or literary and educational opportunities, we have left Africa in search of another life, out of the haunted realms of what we have inherited back home. Against this context, I consider myself an exile – not a political exile, not at all – but a metaphysical exile, with intellectual and spiritual or psychic undertones of having transplanted myself out of Ghana to live around the world. Hence I am a self-coursed émigré, expatriate of the imagination, emigrant of dreams, self-exiled, self-departed on a quest, in search of the sense of distance to write about and mythologize home away from home. In many ways, in my early 20s, I sought to emulate the Irish, European, Russian and American writers who left their homeland for exile, in search of creative freedom. Now many African writers have left home, in search of fertile communities were they could live and pursue their creative ambitions, teach in foreign universities and maintain contact with publishing and reading communities overseas. Sola Osofisan: A good chunk of your writing focus on the immigrant condition in some of the places you’ve made home over the years – UK, US, Australia… Has your personal story on your travels been as conflicted as that of some of your characters struggling to fit into these different climes? How has traveling impacted the way you view the world and the stories you tell? Kabu Okai-Davies: I say it in the introduction of Curfew’s Children “my life is my literature.” There is a strong element of the autobiographical in my writing. I am not one of those writers who deny the autobiographical in the creative process of writing literature. I invest my experiences, thoughts and sentiments into the characters I create. Hence a good chunk of my writing focus on my personal experiences as an immigrant in America, England and Australia. Given the opportunity to do nothing else but write, I hope to bring into the realm of my writing, some of my other experiences in Japan, China and living in the United Arab Emirates (UAE). As a writer I rely on the psychological, emotional, ideological and philosophical conflicts and challenges that I personally experience and they tend to find their way into my writing. My personal experiences or personal observations, things I have heard and see happen, directly or indirectly find expression in my stories. In retrospect, I can say that I have had a rich life, full of conflict, struggles, trials, uncertainty, sickness, fear, fame, fortune, loss, transmigration travels and eventually, self-fulfillment. I am at the right place at the right time, to bring this repertoire of experiences together in order to write interesting characters and dialogue driven novels, which I hope will add to the cannon of African literary works in the near and distant future. Sola Osofisan: You like it in Australia, it seems. In Exiling Exiles, you say “Home is now a point of departure, a place of memory / A palace built on the wings of imagination / And a fictional house of petals in my dreams.” But of Australia you paint a rosy picture of a place “Where back waters are fresh, / Kangaroos graze like cattle / Aboriginal landscape without limits / Serene Seas in the kingdom of fossils…” Tell us about this Australia, the country that has tamed – at least for the moment – your wandering spirit. Kabu Okai-Davies: Of all the places I have lived, after I left Ghana, Australia has turned out to be the best. England was too cold and rainy, socially stratified and too set in its ways, though culturally, intellectually, England has one of the richest literary environments for an African writer. However, I couldn’t see myself living in England for the long term. So I always return to England to visit my relatives. England has always been home in many way, returning there sometimes once or twice a year and it is also my stop over point wherever I am traveling to or from around the world. And of course going to the summer programs at Oxford University was also significant. In comparing America to England, I will say I loved America, its people, its rich African-American history and culture. America forms a very strong part of my identity as an African. I become a man in America and Newark, New Jersey shaped my personality in so many ways. I grew up into mature manhood in America. I struggled there, fought all my battles there and experienced the best and the worst of human nature in America. Indeed America made and then unmade me. I flourished in America, triumphed and went through some of the most challenging trials in America. I have written extensively about my first five years in America in my novel “In Another Man’s Name,” the first chapter – Enigma of Arrival – was recently published in the #155 issue of Transition Magazine. However, there is a violent, predatory and self-destructive aspect of American socio-economic and political life that continues to ruin the idyllic notion of the American dream. America left me feeling robbed of my sense of innocence, its drug and gun culture, propensity for public and private violence, predatory financial structures based on debt driven systems of economic development, robs its citizens of the very idea of economic security that it claims to provide. These sentiments were expressed through fiction in my short story, Leaving Macarena; in this case, Macarena is my fictional name for America. To the question of Australia: I went through a period of wandering, visiting Japan a couple of times, touring Europe, seeking to move from Newark, New Jersey to Atlanta, Georgia and or Columbus, Ohio. But in the end, by reconnecting with my former class mate from the University of Ghana, in Vietnam of all places, who was on diplomatic duty in Hanoi; then I went to Australia to visit her when she returned from Vietnam to Australia, in 2012. Since then I have never looked back. I commuted between America and Australia for four years, got married, started a family, bought a house and I left America for good the 1st of January 2006. Australia is now home, away from home. What is significant about Australia for me is the transcendental sense of space. Australia retains a native or natural idealism that I find very attractive. There is a certain sense of adaptability to nature in an ideal context, modern yet naturalistic. Additionally, there is the idyllic notion of multiculturalism and cultural diversity, a strong desire to live in a space of social, cultural and racial harmony. In fact Australia is one of the leading exponents of this vision in the world. It does not seek to be a “melting pot” but rather a garden of perennial cultures, beliefs and ideas; flowering and flourishing in their own individual and collective ways of being. Of the three countries I have lived in outside Africa, Australia fits perfectly to my idea of home away from home, particularly living in Canberra, which was recently voted as the best place to live in the world. Having access to libraries, museums, parks, public gardens, public walkways, access to universities, festivals, good health care systems, and congenial neighbors, culturally diverse communities of people, living together and supporting each other, provides a rich environment for creativity and self-expressiveness. In many ways there are things about living in Canberra that cannot be measured in monetary terms. Canberra, is a bush capital, people have gardens in front of their homes, back yard vegetable plots, well paved roads. Being from another country is not considered an anomaly. Everything I have written about Australia is true to me. I love Melbourne, Sydney, Brisbane and many other seaside townships, country resorts, and ocean drives my family and I have visited. I enjoy looking and walking around, bush and forest walks, driving on long rides interstate, viewing the mountains and appreciating the landscape, and observing nature at every level of seasonal transition and transformation. It has made me an avid gardener, a closet environmentalist and naturalist. It is only in recent years, after returning home from living in the UAE for three and a half years, I seem to be seeing a new kind of Australia. More people have migrated here and are still seeking to migrate here. Unfortunately being who we are as humans we carry with us the conflicted and wounded identities that caused us to leave our homeland in the first place. Hence many of the conflicts that are now disturbing the world have now found their way into the social and political discourses of Australian life, and now, there is a sense of unease about who stands for what, and why they here. It is my belief that these ideological ground around religion and faith on which we tread now shall also pass. Other than that, I will not exchange Australia for any country. All of this said, it does not mean that Africans in this country are not judged by the barometer of Africa’s tragic failures. Africans are defined by the yard stick of Africa’s history, problems, stereotypes and misconceptions. Too often the African is judged by the evidence of what is going on in Africa through the media, and Australia is no exception. Australia has an ambivalent mind about Africa. Many Australians deeply empathize with Africa’s condition yet wonder about the enigma of African poverty, the breakdown of social systems and rampant corruption with African political structures and the crisis of epidemics that now plague Africa. Australia’s perception of and links to Africa have been forged to a large extent through the prism of British and South African/Rhodesian eyes. Hence the ambiguities and double mindedness about what Africa is and why Africa has become the way it is. In spite of this, Australia is the best place for me as an African to live. Australia has given me so much more than what I bargained for. Australia gave me a second chance. 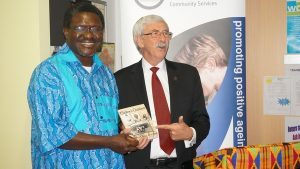 That is why I am striving to do my best by using my writing and presence here to create a reading community of Australians who would appreciate Africa from the perspective of its written literatures. Sola Osofisan: There’s a lot of nostalgia in your writing, a hankering for the past. There’s also a constant longing for home. One wonders what a man like you is doing living abroad, so far away from Ghana and the traditions that obviously fuel your creativity. Is life abroad worth the longing you seem to be inflicting on yourself? Kabu Okai-Davies: This question is at the core of my identity crisis as a writer and an African. Indeed it has been the source of so much conflict and inner agony. Exile creates within the conscience of the exiled a double personality of longing for a lost home and yet striving to create a new sense of home, away from home. I once wrote a play called Home Away from Home, in which I sought to deal with the dichotomy of this situation of hankering for the past home and yearning to make the new place of exile, home. In one way or the other, I think I have reconciled myself to the fact that, the only way to resolve this crisis is to reconcile it philosophically and creatively. I did go to Ghana from September 2011 to December 2012, where I participated in the political process, taught at two universities and also did research work for my PhD. This significant experience of returning home to Ghana, taught me two things. Firstly, it taught me that even though Ghana is home and the source from which my creative vision draws its strengths, I also realized that, I do not belong there within the local context anymore. I have become part of the African Diaspora. Secondly, it also dawned on me that I was not a politician, activist or populist. I am more of a political philosopher, theorist and artist and therefore I can be a theorist, writing about Ghana and Africa from anywhere around the world. Memory, nostalgia and imagination have become sources from which I can create my vision of myself and of home. In essence after leaving Ghana in December 2012, moving back to the UAE and then returning to Australia; I came to the conclusion that Australia can be the place where I can call home. Australia represents the tropical and naturalistic place, homely and yet distant enough to provide me with that home, away from home. And therefore Australia provides the best way to compensate for living overseas and longing for home. Ghana has now become the home where I can visit as my home country, as often as possible, but not staying too long, less the frustrations and contradictions of African life that caused me to immigrate in the first place might reemerge. I have decided to be a constant visitor, returning home in need of creative fuel, reconnecting with family, tradition, myth, history and heritage; yet living in a state of perpetual exile, to use the metaphor of distance, to provide me with a sense of intellectual and creative objectivity to write about home. Sola Osofisan: Many writers in Africa are activists who consider literature a potent weapon in the struggle to elevate the status of the common people and maybe save the soul of the elite along the way. As a matter of fact, you once said “writers are cultural and social agents, who have the responsibility to expand our sense of human empathy.” Was that the impetus for you going into politics? Kabu Okai-Davies: I used to believe the writer has a role or responsibility to use the power of literature as a medium for social transformation and to participate in the struggle for change, elevate the social status of the common people, bla, bla, bla…No more. Though I still hold onto the idea of expanding the sense of human empathy, I do not believe writers have to carry the cross of history as a pre-condition for being a writer. 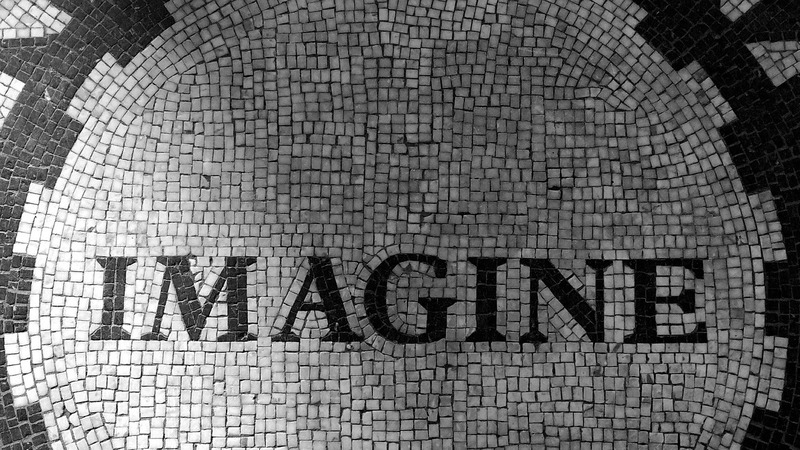 What I now believe is more of an inner quest for perfection in art, craft and inner self-transformation, so that through the medium of good writing, one can place an unflinching gaze on the enigma of African life and the ambivalence of African history against the evidence of our tragic humanity as a people, caught within the contested experiences and conflicting narratives of post-colonialism and of globalization. Writers have a responsibility to master the craft of writing, not through public activism, but through the solitary activity of inner self-perfection. Our true audience is our progeny. We must seek the approval and vindication of posterity and therefore, writing in silence, we become connected to a universal spirit whose very existence is yet to be born. Yes, we need the support and appreciation of our peers and contemporaries to live and establish ourselves as writers, but indeed, the real essences of why we write is to speak to the spirit of humanity yet to be born. That is why dead writers continue to influence and shape the course of our lives and of course, history. Fortunately for me, I have lived a very active life and I have been socially, culturally and politically engaged. I have a rich memory volt of stories, experiences and dreams from which I can draw material to last me the rest of my career. Now I just want to write, immerse myself in the solitary act of writing novels, poetry and plays as a way to emerge from literary obscurity, build a global community of readers – actual and virtual – who can appreciate my work, without being an activist of any kind. Let my stories do the activism and all the uplifting of the masses, hence getting Africans to read. Through socially and philosophically engaging literature, I will be able to advance the course of my new form of activism, silently. Sola Osofisan: Politics in African countries is generally a no-go area for writers because African politicians tend to be corrupt and devoid of any serious ideological compulsion, which qualify them for the caricatures and villainous characters in our books. Is your foray into politics a brief flirtation or a long term relationship? Are you not worried that when a writer gets into politics in Africa, he has to fraternize with folks who often have no clue what role imagination plays in the building of a people and nation? Isn’t this suffocating on so many levels? Kabu Okai-Davies: You are absolutely right. It is in the fraternization with those whose existential situation is linked to the corruption, brutality and vandalizing of the public purse, that creates the situation of alienation for the artist or writer who decides to go into politics. My personal experience with the democratic process in Ghana is such an example. I came face to face with the darker side of democracy and felt seduced on several occasions to succumb to the will of the very forces of corruption for which I was fighting against. Fraternizing with the status quo ultimately undermines the writer’s will to legislate from the position of a moral high ground of conscience and faith. Instead, politically active writers turn to become rhetorical propagandist. Their writing suffers and their talents auctioned to the highest bidder. The poetic spirit of a politicized writer becomes stale and one dimensional. They lose their observational abilities, critical gaze on society and moral judgment. In the end they betray the very spirit of integrity, honesty and ideological purity that drove them to enter politics in the first place. In time, I have come to realize that there is something sacred about writing. My brief but significant involvement in politics taught me that. Hence my participation in the political process as a parliamentary candidate was indeed a flirtation. I have learnt that writers, real true writers, must stay away from politics and rather, write well, observe from a distance, spend solitary time musing on the evidence of history as a spiritually engaged participant, while crafting original narratives as part of the process of shaping the unformed conscience of the race. The decision to be a writer and the obligation to write is a political act in itself. That for me at this moment is enough engagement, without entering into the arena of politics to dirty my conscience with the corrupting influences that come with fraternizing with “folks who often have no clue what role imagination plays in the building of a people and nation?” In the end, the politicized writer suffocates and dies before their actual death. Sola Osofisan: In your short story, “Chronicles of a Curfew Foretold,” you retell what is obviously the Jerry Rawlings era in Ghana. When Rawlings assumed power via a coup at a time when Ghanaian professionals were scampering all over the world just to get away from the country and make a living, he was called a dictator and reviled. Today, Ghanaians appear to be benefitting from a strong foundation that can arguably be traced back to Rawlings who eventually got elected twice as a civilian president. It has been suggested that the Rawlings template is needed in some African countries, and that we seriously need to consider lining up the constantly recycled old brigade of corrupt leaders and, you know, “clean house.” What do you think? Kabu Okai-Davies: This is a two edged sword question. The philosophical vision and political fact behind this question are laudable. But, I am ambivalent about this, twenty to thirty years later. I will not deny the fact that Ghana needed a Rawlings at the time he emerged on that political stage of Ghana’s history. But what he did then, will not be easy to duplicate in another African country. Every African country – to a large extent – have their military strong men, for better or for worse. What I have come to realize is the need for the reformation of the African mind. That Africans have a task of doing the home work of history to make the transition from a non-literate culture to literacy, superstition to scientific thinking, etc. The myth of the strongman syndrome is over-rated in African history and politics. What we need is not another strong leader, but leaders who are readers, intelligent and sophisticated. Ask any Ghanaian in Ghana today, Rawlings is one of the most politically frustrated ex-leaders I can think about. Whatever foundation he set up, has been overtaken by the weeds of corruption, public filth, incompetence, tribalism and traditionalism. The very things he fought against. What is keeping Ghana’s democracy afloat is not what Rawlings did in the past, but rather the myth of violent death that befalls military leaders who once ruled Ghana. This I believe is keeping the military at bay and preventing future military adventurists from resorting to anything unconscionable. These conflicting and contested ideas about Ghana are the subject of my novel in progress, called: The Sorcerer’s Democracy. It chronicles my months of political engagement in Ghana, set against the backdrop of the mythologies that shaped Ghana’s history from the pre-colonial to the post-colonial period. In essence one has a conflicted appreciation of Rawlings. His was more of a military revolution than a social transformational one. The premise of my novel is to use fiction to show that Ghana did not win its independence so that it will be linked to the total liberation of Africa as Nkrumah imaged it. But rather, Independence was won so that we will return back to the past, in order to reenact and relive the traditional ways of our African ancestors. Hence Ghanaian social and cultural life is more of an act of emulating our ancestors, re-enforcing the mendicant relationship between the powerful and the powerless, the colonizer and colonized and maintaining leadership systems based on servicing the leader, instead of the leader serving the people. Democracy has indeed brought out the deeper vices of tribalism, public misuse of the freedom of speech and a national indulgence into the decadent social and cultural habits that made it possible for Africa to be colonized in the first place. In my opinion, Rawlings has become more frustrated than anyone can imagine. Politically he does not matter anymore, and the foundation he built has been hijacked by a new gang of political brigands who have no sense of moral guilt in the squandering and embezzlement of the nations’ wealth. Through the medium of fiction, I intend to dissect Ghana, historically, culturally and metaphysically, to answer this question in its larger context and its philosophical implications. Sola Osofisan: Which books do you find yourself often re-reading and why? Kabu Okai-Davies: In my case it is more about the writers and their books as a collective, rather than a particular book. These are the writers that influenced my formative period and though I have discovered more writers (and still discovering), I keep returning to these authors for a richer understanding of the narrative craft and to understand the subtle nuances of plot, storytelling and the use of language to describe and show. By nature I am an interior driven writer and my training as a playwright serves me well with dialogue. However, learning how to show a story has become more relevant to me now and so I keep returning to my creative mentors for help. Achebe – Things Fall Apart, D.H. Lawrence – Lady Chatterley’s Lover, Son’s and Lovers, Women in Love, Richard Wright – Black Boy and Native Son, Ngugi WaThiongo – Petals of Blood, Tolstoy – Collected Short stories, War and Peace, Gabriel Garcia Marques – Hundred Years of Solitude, Autumn of the Patriarch, Love in a Time of Cholera, Chronicles of a Death Foretold, Ben Okri – The Famished Road; Toni Morrison, the Bluest Eye, Isaac Bashevis Singer – Love and Exile, Collected Short stories and of course the literary works of philosophers like Jean Paul Sartre, Friedrich Nietzsche and Bergson. The writers who have influenced my later period are: Sebastine Barry, Junot Diaz, Orhan Pamuk, Nicole Krauss, Anne Enright, Italio Calvino, Jorge Luis Borges, Richard Ford and quite recently, Australian authors like John Clanchy, Alex Miller and Richard Flanagan have also influenced my narrative vision. Of course, contemporary African writers include Teju Cole Open City, Chimamanda Ngozi Adichie, Purple Hibiscus, and Dinaw Mengestu, The Beautiful Things that Heaven Bears. Sola Osofisan: Do you sometimes feel like you’ve been in the classroom all your life? I mean it is as if you’re collecting degrees…how many do you have now? Have you ever said to yourself, I really should stop now? Kabu Okai-Davies: This is an interesting question. To be honest with you, this whole degree thing is driven more by frustration, than by ambition. In my case, being a writer, who is yet to secure the opportunity to be published by an established literary publishing house or even secure an agent, the best way to keep myself creatively alive is to find a way to write with a sense of purpose. Going into the academic world from university to university, allows me to keep on writing, to be disciplined, meeting deadlines and going after one course after the other, one essay after the other, story after story, until such time when the publishing world would come around to accepting my work for international publication. The other side of this is that, being in the university offers me the opportunity to come in contact with other writers, smarter people, lots of lecturers and professors who have read my work, provide feedback and support. Hopefully with online publishers like AfricanWriter.com taking a keen interest in my writing and providing the venue for a reading audience, I am hopeful that I will become a published author, contracted to a publishing house and all the manuscripts sitting in my “imagination room,” will be transformed into publishable novels in the near future. Therefore at this stage, I can’t tell. I have a couple of degrees. The possibility of finishing a second doctorate in Post-Colonial African Literatures is in the pipeline, still working. Sola Osofisan: There is sniggering in some circles when the current crop of video movies from the emerging industries of Nollywood in Nigeria and Ghollywood in Ghana are mentioned. As someone who studied theatre and film production, how do you perceive these video movies and perhaps the potentials they hold for African cinema? I was once a lecturer of African Cinema at the New School University in New York, when it was called the New School for Social Research. I have varying opinions about what is going on with the Nollywood / Ghollywood notion of cinema. Over all, African cinema as a whole has not found a true vision of itself, whether at the continental level or at the regional level. A lot needs to be said about this and probably in a separate interview, I might expound more on my vision of African cinema in its larger and broader context. African Cinema has gone through two stages and is now in search of a new third stage. The first stage was the Classical period. It was the first stage that sought to resort the notion of African identity in the lead up to Independence and the post-colonial era. This movement was led by Ousmane Sembene, Black Girl, Souleymane Cissé‘s Yeelen (Mali, 1987) and Cheick Oumar Sissoko‘s Guimba (Mali, 1995). There was also Kwaw Ansah from Ghana, Love Brewed in the African Pot. (1981) This movement attracted international attention, because there was a sense of vision, identity and a quest to use the medium of cinema as a means to tell untold African stories, driven by myths, heritage, magical interpretation of history, politics and social realism. However the current movement in African cinema is the commercial period. This period has taken advantage of the digital revolution and has adopted the video and digital camera into the arena of African storytelling. Unfortunately for this generation of filmmakers, the desire for instant gratification, material and commercial success, seem to overshadow the need for an artistic, technical and quality based production process. It has therefore become repetitive, over-dramatized, stereotypical and exploitative. It has sought to appeal to the sense of African sentimentalism, disconnected from the historic and political underpinnings that are threatening Africa’s future today. The commercialization of African cinema, though necessary, lacks the level of sophistication that is required to make African cinema attractive in the world film distribution market place. Hence its localized audiences, who seem to be hypnotized by the intoxicant nature of African video movies, soap operas, traditional comic characters and the exaggerated use of farce to maintain a plotline. Too often African video movies fail to be artistically sophisticated. They tend to be monotonous, repetitive and exploitative of African stereotypical characters and storylines, hence they fail to attract diverse audiences not only amongst Africans but around the world. There are occasionally brilliant works coming out of Africa when the production is a joint production with American, French, or British production companies. The recent success of African actors on the international stage/scene must give hope to the future that if African cinema is to vindicate itself, there has to be the need for a fresh approach to filmmaking. African filmmaking must enter a new creative and innovative phase if it is to experience a golden age as an industry. If we are to earn the respect that Bollywood has gained around the world or the renaissance of Chinese and Japanese cinema, African filmmakers must adopt their medium to the technical, narrative and artistic rigors required to create visually rich, diverse and intelligent story plotlines, to attract a global audience. African cinema must evolve industrial structures with systems for the training of actors, writers, directors and producers. African governments must appreciate the economic potential of cinema to national economic, social and cultural development and put in place policy initiatives, including funding to encourage talented writers, actors and directors to get involved in the industry. African film makers must collaborate with African-American filmmakers, British and European film industry and if possible work with Chinese, Indian and Japanese cinematographers to bring a fresh interpretation to the rich heritage of African life and history. There are many untold stories, about love, history, politics, society and family life in Africa that deserve to be given cinematic rendition. The recent adaptation of Chimamanda Ngozi Adichie’s Half of a Yellow Sun, and the direction by Amma Asante’s Belle are proof that through collaborative efforts, great cinematic artistic works that are both realistic and commercial can be produced to give African cinema an international cross-cultural audience, win awards and restore the prestige and honor of the African in the world film industry. Sola Osofisan: Tell us about Curfew’s Children, the book you launched recently. Is it your memoir? Kabu Okai-Davies: Curfew’s Children is essentially a memoir. A coming of age story set against the backdrop of the history of Ghana, and the maturing of a child into boyhood. It is not just my growth into maturity as a child or young boy, but of the nation of Ghana itself. Ghana becomes the canvas on which I paint the narrative of my life, tracing the birth and the maturation of the nation through the 50s 60s and 70s. It traces the struggle for independence, the fall of the Nkrumah regime, the rise of military interventionism, the mythologies of tribe and country, history, evolution of family stories and how they all come together to shape my vision of myself as a Ghanaian in the Diaspora. My mother is featured strongly in the narrative and from her perspective, I tell my coming of age story as a boy growing up in London, and in Accra. It is also a book about memory, a hankering as you say, to a lost past. It is a book about the memorializing of my mother, mythologizing my father whom I didn’t know that well, and to craft a vision of a country through the narrative about my affection for my larger Okai and Davies families. It is a work of creative non-fiction and a product of my experiences to bridge the gap between the autobiographical and historical narratives; between fact and imagination, memory, nostalgia and dreams. In this case I use the idea of the curfew as a metaphor of the curfew that was imposed on the country at the time Rawlings came to power and also the intellectual, creative and metaphysical curfew we have imposed on our history. It was in the realm of the curfew that I came of age, re-wrote the inner narrative of my life, and forged for myself a vision of my future away from Ghana. Sola Osofisan: A diplomat’s son who married a diplomat – coincidence? Kabu Okai-Davies: This is the gift from the fortunate hand of time. Call it coincidence, fate or miracle. I think it is heaven’s way to compensate for what I did not experience in life through my father. My wife has made up for all that I once could have had, or could have been, if I had lived as my father’s son. Being a spouse of a diplomat offered me the opportunity to read and write, rethink the direction of my life while we were on posting in the UAE and of course, I was able to take the time off to stay in Ghana. I totally experienced the whole modern mythology of the Abu Dhabi and Dubai experience and story, and I am grateful for that. Sola Osofisan: I’m getting the impression that you had a difficult relationship with your father. Is it something you can share with us? Kabu Okai-Davies: The truth is there was no relationship to start with. So it wasn’t difficult. Rather, my father was more present in my imagination than in reality. I also write a lot about him in Curfew’s Children. In the end the presence or the absence of a father in a person’s life, especially a writer’s like, directly or indirectly shapes the creative vision of the writer.